PW A Warsaw Indoor World Cup! Summer holiday is over and I went back to school, well at least for one day. One day at school and straight to something really exiting, rare, awesome and sick: the PWA Warsaw Indoor World Cup Poland 2014! Indoor windsurfing, is that possible? – Yes, it is! It basically means we are sailing in a pool! The last time, there was an indoor, has been 8 years ago, in Gent, Belgium. This year it’s in the national stadium of Poland, right in the middle of Warsaw! 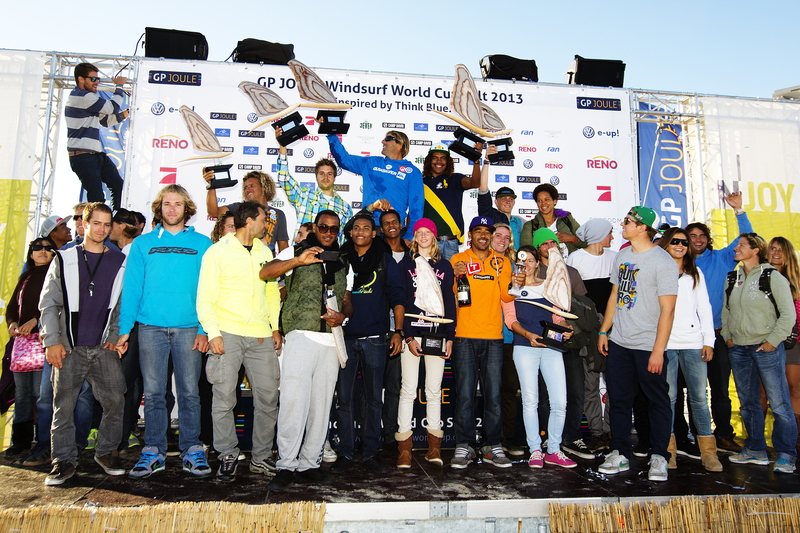 The event took 4 days of which 3 with windsurfing action! In 3 days there where at least 35.000 visitors! The stadium had the biggest pool ever being 90 m long, 33 meters wide and 34 fans giving us wind. There were a lot people that had to train, so the first training sessions were at 8 in the morning. Luckily the freestyle wasn’t up first and I had some time to sleep. I came to the stadium around 10. The fans needed more rest than expected, so the training sessions took a lot of more time, than first planned… So at the end the PWA was forced to skip the women’s freestyle training as we didn’t compete on Saturday evening and all the other disciplines did. I was a bit up disappointed because I was so much wanting to sail in the pool! It was amazing to see there were so many people working to get this event really nice. There were lots of huge cameras, lots of people and not to forget there was some great action by everyone! I enjoyed the show a lot! As there wasn’t much time to train in the pool Saturday, we were starting again at 8 in the morning. I was really exited, not only because its awesome to sail in a pool in a huge football stadium, but also because the guys didn’t do super difficult moves and some where even crashing things like spocks, so I was a bit scared to not be able to land any move what-so-ever. I had my first run, didn’t crash in the start! Yes! The jump training was still going on so I couldn’t do a move yet. But I was getting the feeling, and by the time the jumping girls where done, I landed spocks, grubby and puneta’s! Yesyesyes, I was ready! After a day of waiting it was time to get ready for competition! I never felt this nervous getting on my wetsuit, I got the gear ready and the show could start! First the introduction of the riders, this was awesome again! Huge camera’s were filming us, people were cheering and I was having great fun! Freestyle was up first so I kind of run to my gear, got it to the starting line and here we went. My first run wasn’t so good, I was so nervous and I didn’t have enough speed, so let’s forget about this one. On the way back I again didn’t have enough speed to do a puneta, so I tried a eslider instead, halfway I was looking back when sliding and I saw I was a bit too close to the edge of the pool and I had to crash to make sure not to fall out…. At least I didn’t end up falling out, only half of my sail did while throwing down a fence with a PWA flag on it. I made the crowd’s laugh a bit so it’s alright. I lost lot’s of my nerves on my second run, I was able to land a perfect spock! On the way back I did a switch Vulcan, not completely what I wanted it to be, but anyway better than nothing! With these moves I became 3rd in the women freestyle competition. This day was one big roller coaster, in which happened so much! The feeling to do your moves in front of so many people is unbelievable and there are no words for it! Sunday was just a day of fun and relaxing for me basically. There were a lot of watersports going on in the stadium like sailing, waterpolo, wakeboarding and the Dunkerbeck Speed Challenge, but I didn’t compete as I only had my freestyle kit anyway. I have never seen a event organised this well, I really felt like a professional athlete going to the Olympics! I will never forget this event! Thanks to all organisers, sponsors, family and friends for everything! The PWA c alender is finished for the overall ranking freestyle women. The only event left for this year is the indoor in Poland. The indoor in Poland doesn’t count for the overall ranking, which means that my overall 3rd place overall is for 99% sure… Why 99%?, well there still is the event in Margarita on the PWA calender, but as the political issues don’t seem to have changed, it is not likely that the event will be organised in 2014 . I am super stoked knowing I am now on the overall 3rd place in the second year on tour, so I started my trip to Naxos more motivated as I ever was and ready to train even harder. The trip to Naxos was quite long, since there is no direct flight going from Holland to Naxos. So we went from Düsseldorf to Mykanos by plane and from Mykanos to Naxos with a ferry the next day. The wind wasn’t strong, so we had enough time to settle down, give my foot a bit more rest and chill a bit. At the end the chilling turned more intro stressing, because the apartment we booked was overbooked and there was no other place for a respectable price… lucky enough Stam (the owner of the windsurf center) was with us, and helped us out finding another apartment..
Laguna beach park is the perfect spot for freestyle, it offers lots of different conditions. In 3 weeks time I have been using my 3.6 up untill 4.8. Even though the wind shifts a lot in force, the wind is still really stable. 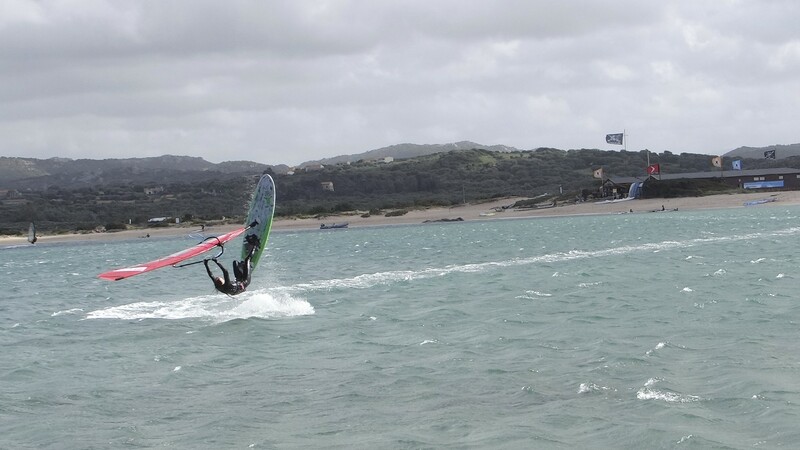 Not only the wind is perfect to improve your windsurfing skills. There is a big lagoon that offers flat water and choppy water, and there is a small lagoon that has some big chops with big periods coming in. I have been training lots of moves, most of them new, like kono, shaka, shove-it and moves on my less favourite tack. I also trained moves I can do and make them more consistant. I improved my skills, learned a lot and had a really good time! Thanks everybody for the help, the hospitality and the awesome time. Movie coming up this weekend. Now let’s get ready for a really exiting experience: The PWA Warsaw indoor! 🙂 EXITED! Summer holidays started and I was straight of to Fuerte! 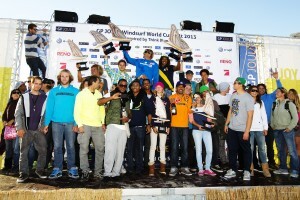 Full of energy and motivation I was ready to start the 2nd PWA World cup of the year! It was great to see everybody again and see everybody rip the waters of Fuerteventura! A few days before the PWA Freestyle started I crashed badly on an Airflaka…. I landed wrongly and hurt my both feet. I took some rest 3 days before the event, but my feet didn’t seem to improve so I went together with Arrianne, who crashed really hard on a ponch (she wasn’t able to walk and had to skip the competition), to a local doctor to get things checked. At the end it wasn’t something really bad and I could stil sail without making it worse, it only hurted quiet a lot with sailing. In the single I was a bit unlucky since they make up the single based on the ranking of last year. As rankings have been changed a lot since last year. I was really unlucky to be up against Oda straight away. The conditions were going all over the place and it was hard to choose what sail to rig. I rigged my 3.6 and 4.0 at the end. Just one heat before my heat the wind dropped and I wasn’t planing on 4.0 anymore. Lucky enough I could borrow Dieter’s 4.4. As I didn’t sail for 3 days, still feeling my feet a lot and not having my own sail. I wasn’t able to sail a really good heat. The double went a lot better, my feet were feeling better, the conditions were better and I had a good warm up session. I managed to sail some solid heats in which I landed 4 moves on both tacks. At the end Yoli was sailing really good and I didn’t in the heat against her so she won. This gave me a 6th place in the PWA Fuerteventura. There wasn’t enough wind and so no time to do another single and double elimination for the girls. This made Olya and me on a shared overall 3rd place. Lucky enough there was enough wind later to do a sail-off. The wind wasn’t perfect and it wasn’t as choppy as the days before. I managed to land 2 good and 1 half move to the outside and 4 good moves going in. 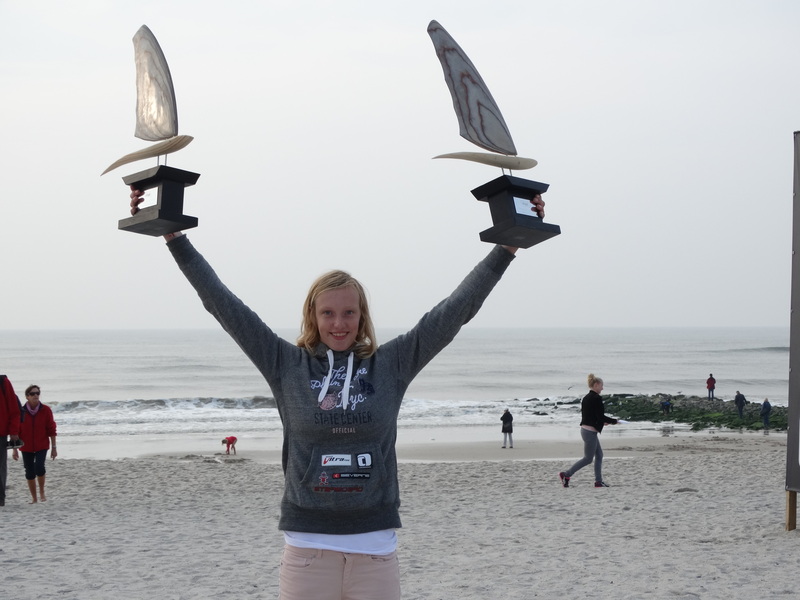 As Olya didn’t seem to have a lot of power or a too small sail and crashed lots of her moves I won the sail-off heat, which gave me an overall 3rd place in the PWA Woman Freestyle 2014!!!! I have learned a lot this trip and I am super stoked with my 3rd overall place! I still can’t believe it! Congratz to Sarah-Quita for her 7th world title and Oda Johanna for her 2nd place! Thanks everybody who helped me going to the doctor, helping me out caddying, borrowed me some equipment or anything whatsoever!Thank youuuu!!!! 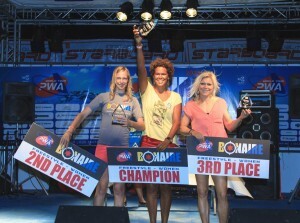 PWA Freestyle Bonaire — 2nd place! My first time Bonaire…. And it was amazing! ever: P! Everything is perfect…the wind, the temperature, the people, the colours… and I can go on for this for a long time. After 2 single and 2 double eliminations I was on the 2nd place, sailing 2 finals in both the double eliminations. I am super stoked with my result! 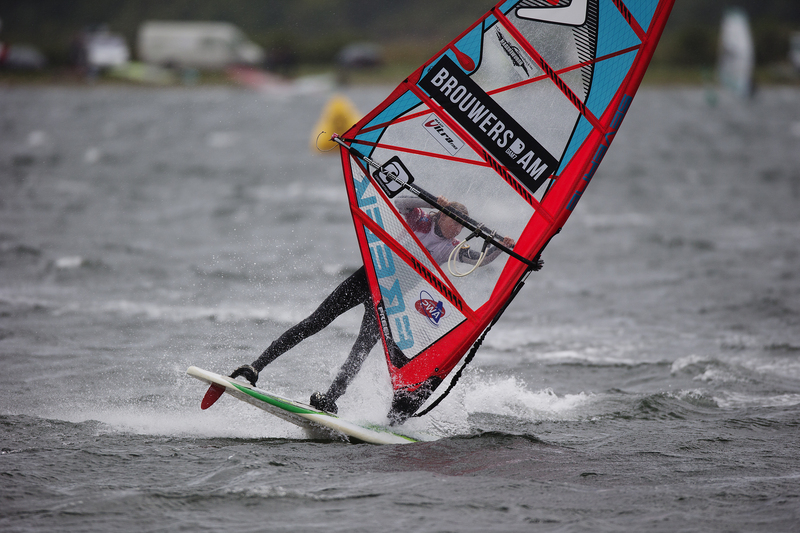 My first single elimination wasn’t that good….. with a shared 5th place and sailing a bad heat I wasn’t really happy yet. Having the first night ever having to puke all the time and only sleeping for a few hours… I somehow got the energy to sail again. The conditions were perfect, I was really confident in my heats and by the time I had to sail I was full of energy again….. I could work my way up the ladder sailing some good heats and the best of all I got my first ever PODIUM during an event! The 4th day the conditions were crazy! I was fully overpowered on 4.4 but with the other sails I was crashing all the time…. So whatever…. Just like most of the guys I was on 4.4 :P. So after the second single elimination, not sailing a really good losers final I was on the 4th place. And again feeling super confident, having perfect conditions and having had a good night of sleep… The second double elimination was started! Again I managed to work my way up the ladder, having some really close heats against Yoli, Oda & Arrianne. I am super happy about the heats I sailed landing all my moves. Congratzz Kiri & Sarah. Never saw the level this high! I have enjoyed every moment of Bonaire and hope to be back soon! Now I have to focus on some schoolwork for another week and than it’s time for holiday… whooh! Next stop Fuerteventuraaaaaa! Hi, I finally have the time to write a report from my trip to North Sardinia. I had a super nice 3 weeks in Sardinia with a lot of new moves, crashes, pain, laughs and happiness. 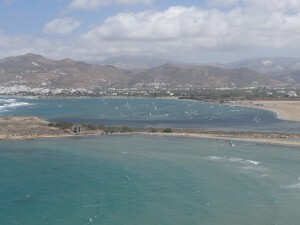 Did a lot of windsurfing, supping, relaxing and more! The second week my parents arrived and we went to some other spots in the area. The wind was way better. 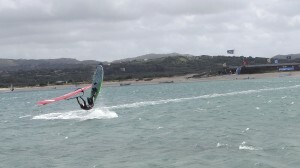 In second and third week I went windsurfing 10 out of 14 days. We went to 4 or 5 different spots with different conditions. I sailed mostly in the chop but sometimes also in the flat. I used all my sails from a underpowered 4.8 and small chop to an fully overpowered 3.6 with 1.5 m waves, in the middle of the bay of porto pollo. And also my sister started planing in her footstraps and even did her first jump . 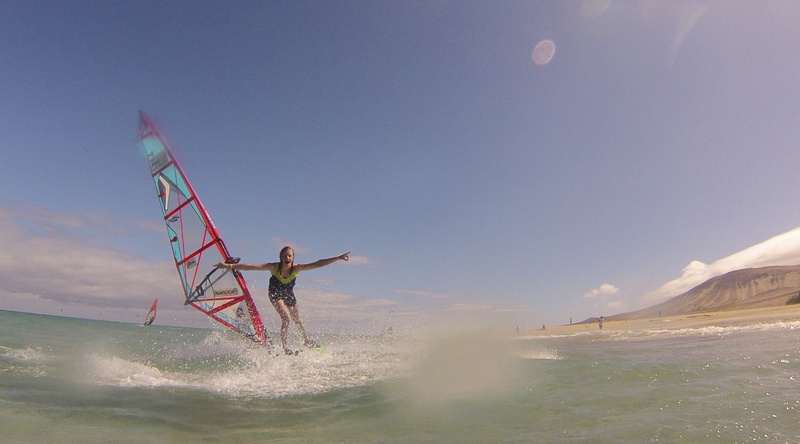 In the end I met a lot of new people, discovered some nice windsurfing places and had a super sick time windsurfing. I am ready for the PWA on Bonaire, 1 month and 5 days to go! Whoow! So after all that was not it for the year . After finishing 6th at Brouwersdam, I was ranked 6th overall and so first in the youth ranking of 2013. So "of course" we decided to go to Sylt the last weekend of the event for the pricegiving. After having a lot of traffic jam in the morning and having a journey of 11 hours instead of 7, we finally made it to Sylt. No wind, no competition, no action but enough to do. Had some good fun! I was cool to be around and super happy with the price, it's for sure a good motivation for next year! After all, this year went really fast, too fast but the positive thing of it ending is that I’m now ranked 6th in the overall ranking of 2013, After getting 7th in Fuerte and 6th in my home spot the Brouwersdam. Brouwersdam was great. With the first cold days of the year but also windy, really windy. And with the best freestylers of the world around, there was some great action to be shown! One week before DAM7 started, I checked the forecast every 30 minutes hoping it had changed because it didn’t look too “good” with an average of 4 knots a day. And when I had given up the hope… suddenly there were 40 up to 50 knots predicted for the second day and 20 knots for the rest of the week. Though from this moment on the forecast started to change about every 3 hours: wind-no wind-wind- no wind. After some time it was more like wind-wind-no wind-wind-wind, so I was pretty sure some wind was going to come. So No wind on day 1 but no stress tomorrow was the day. Day 2, getting up early but really excited to start… No wind. Slowly it started to come up in the afternoon. Competition started, yeaahhh!!! 1 hour before the heat, the wind picked up and I decided to go on 4.0. Went well and had a little break. 10 minutes before started, the wind seemed to have pick up, maybe I’ll go on 3.6, tested it out. Good and start, ever so excited to do well on my home spot but after not sailing for a long time because there was no wind I’m quiet happy landing 2 spocks and have won from Francesca Floris. I went out to train a little bit, I improved again, starting to land flaka’s, esliders etc. Only getting a little bit overpowered and rigged my 3.3. Heat 2 up against Arrianne, no way I was going to win that but good practice. Just a few minutes before the heat, it started to get windy, really windy!! I wasn’t able to sail a strait line with my 3.3…. Though happy to have landed a flaka. After this all I got 5th in the single elimination!!! The next day the wind was up and down. After some time it was enough to sail and so we started. I was happy they finished one round of the dubble of men so it took a little bit less time. The wind picked up and I was on 4.0 again. I was in the second round against the winner of Hanna Heidemann and Eva Chiochetti, Eva won .My heat was not quiet good… I could only stick two spocks but it was just enough, than the next heat up against Maxime, my heat went not really good but also not bad, I had a really fast flaka and 3 vulcans, first I had won and I already sailed my heat against Oda for 5th and 6th but the judges made a mistake in the heat against Maxime and she had won… So I got a 7th place. Just before the start of PWA Brouwersdam I got an exiting offer. I was asked to be a national teamrider for both Starboard and Severne Sails. Since I am surfing on those brands from the day I started freestyling, I am very happy with that. Also in the same period I found another sponsor, Urban Beach Nederland. They have nice clothes to wear on the beach. First competition day! There was wind up to 30 knots so a perfect day for competition! We started with the first two rounds of the man single elimination and right after we started the women, I was in the first heat of the women against Karin Jaggi. I landed one spock and one 1hd spock. I was really happy with it since the conditions are so hard there, especially because I’m used to real flat water. We finished the single elimination with Sarah-Quita Offringa as winner, Arrianne Aukes second and Yoli de Brendt third. No wind at the beginning of the day. They started the men’s double elimination at 4 pm and got two and a half rounds finished. It was a lot of waiting but cool to be around! We had to wait a little bit for the wind but the double resumed at 11.30, since they got far yesterday, I was up pretty early, I was against Svetlana Martynova. I had my best heat ever, landed a spock, flaka, switch airjibe and nearly a eslider but couldn’t win. The double got finished with Sarah 1st, Arrianne 2nd and Yoli 3rd. I was now ranked 9th together with Heleen and Francesca! We started the second single elimination, the wind was pretty perfect so we started early. I had a heat against Svetlana again, this time only landed a spock, still I was happy because I won the heat J. I was really happy with that. Than another 40 min later, I was up against Arrianne which was a real relaxed heat for me, because I didn’t expect to win, although the heat didn’t go as I wanted it too, only landed a vulcan, I had a lot of fun! And again Sarah 1st, Arrianne 2nd and Yoli 3rd! 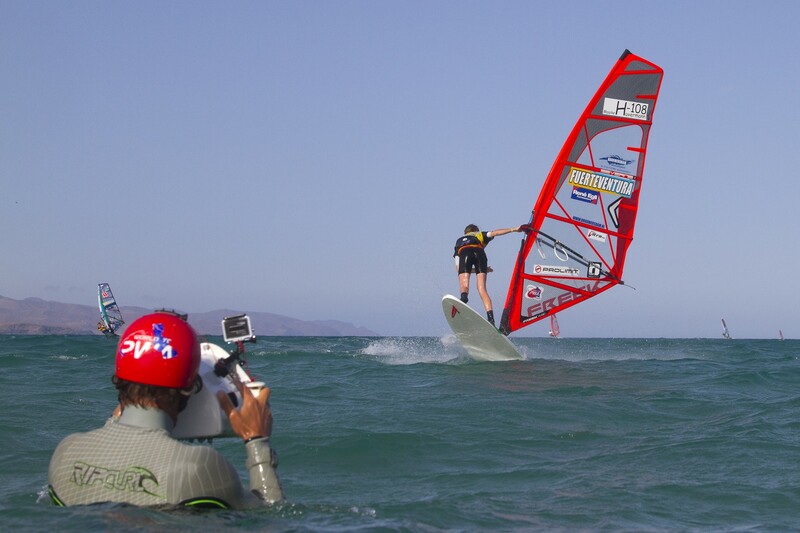 It was really cool to participate in the PWA Fuerteventura, I’m really looking forward to the next event at Brouwersdam. Fuerte video coming soon, stay tuned! Special thanks to Zeil&surfcentrum Brouwersdam, Maui Ultra Fins and Prolimit for the support.